Cornell University’s Department of Communication is part of the College of Agriculture and Life Sciences, which is one of seven undergraduate colleges at Cornell University. 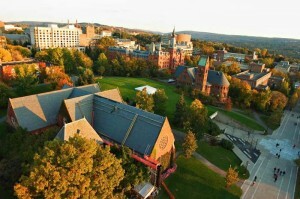 Cornell is an Ivy League institution that was founded in 1865. The main campus, which includes the College of Agriculture and Life Sciences, is located in Ithaca, New York. Cornell has the rare distinction among institutions founded in the 1800s of having admitted students without regard to their gender, race or religion from its very beginnings. Cornell has an enrollment of more than 20,000 students worldwide. Cornell’s Department of Communication emphasizes a deeper understanding of communication than many other institutions do. It focuses on teaching communication as a social science. Cornell communication students study science, media and technology in order to understand the changing world of technology. Students are helped to understand the role communication plays in human society and are trained to work towards increasing the effectiveness of communication in today’s world. Regardless of who is doing the ranking, Cornell can nearly always be found within the top twenty of any list of the top institutions in the world. The Department of Communication itself was recently ranked within the top ten in the United States by the National Research Council. Even undergraduate students are encouraged to create a program that reflects their own area of interest. Advisors work with students to identify which courses will best fit their needs. Cornell communication students receive a Bachelor of Science, and students are required to study the same subjects, including statistics and research methods, that any social science major would study. In their sophomore year, students choose from among four areas of focus: Communication, Environment, Science and Health; Communication Media Studies; Communication and Information Technologies or Communication and Social Influence. The graduate communication program at Cornell is even more flexible and individualized than the undergraduate program. Each student’s special committee, handpicked by the student from among the staff, produces an individual curriculum for the student. Graduate students focus heavily on research in this program that emphasizes the science of communication. Graduate students receive financial support from the school and emerge from their programs as scholars who are prepared to take positions as institutional or private industry researchers. Cornell’s campus sits on 745 acres in the Cayuga Lake area. So many students live on campus in the dorms, residence halls, apartments and residential colleges that the campus was assigned its own zip code. The campus is not suburban, but not exactly urban, either. It is better classified as a small city campus. The campus was designed by a fascinating hodge-podge of designers and planners, including Frederick Law Olmsted, who designed the grounds of Central Park and the Biltmore Estate. Although Olmsted’s ideas were abandoned before they were completed, his influence can still be seen on campus, particularly in the positioning of McGraw Hall, which faces away from the center of campus towards buildings or features that never materialized. Cornell is home to 36 varsity intercollegiate teams, all known as the Big Red. Campus life is very social, with more than 900 official student organizations as well as 70 fraternities and sororities. The Princeton Review ranked campus food at Cornell 11th in the nation. Perhaps the food is partially to thank for the 41 Nobel laureates to be found among current or former faculty and students.